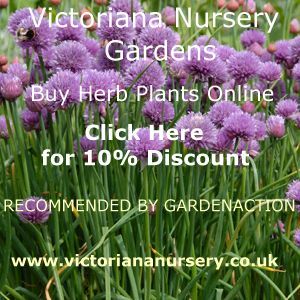 A member of the onion family, chives are well worth cultivating in the vegetable and flower garden. They take up very little space, and the whole plant can be eaten from top to bottom. Edible flowering herb from the onion family. If the flower heads are not removed, they are ideal as a decorative edging to a flower border with freely produced purple flowers. A less common variety is Chinese chive which has a delicate hint of garlic in the leaves - these too produce flowers although not so many - they are white and appear in late summer. Chive seedlings soon after germination This is simple! If the soil has been prepared as described above, just sit back and watch them grow! They are almost completely free of disease, and their only requirement is watering if the conditions become very dry. They occasionally suffer from onion fly, but this is almost always because they have been planted near onions which have been attacked - the solution is not to plant chives near onions. Message: Parsley and chives take time, wait a bit longer. Message: I plant my parsley and cnives 2 week ago in my pot ,and they didn't come out of soil yet.How long is take to see them to come out . Message: Good info many thanks. Will return to site. In my back garden in west London, i have a few chive plants, obviously planted by one of my previous home owners. Besides them, there are also plants of a chive-like species, which grow a cluster of white flowers shaped into a half sphere, not a ball of violet flowers. Please advise they are also a variant of chive. Message: have always grown chives successfully, but of late am having no luck, they turn brown and wilt, and thats that. l live in Hervey Bay, Qld. We have had huge amounts of rain for so long,maybe thats why! Message: I recently bought a pot of chives from a supermarket and they were all standing straight. Within a few days most lent over. Is this normal and if not how do I correct it? I live in Grenada and are preparing to start a small scale organic vegetable garden. Over here they usually sell the chives including bulb. It seems to be that it is more economical to cut them close to the soil as I assume that they will regrow faster that way. Am I correct?